With the Keeley Monterey you take one step back in time and two steps forward. The Monterey is a surrealistic envelope of neo-vintage effects. It combines classic sounds with new interpretations to create a modern timbre and audio spectrum for guitarists. The Keeley Monterey Rotary Fuzz Vibe has a vintage fuzz, rotary speaker, vibe, harmonic and auto wah, an octave up or octave down, as well an expression control to allow you to create a rich array of new and newer sounds. There are two channels on the Monterey Rotary Fuzz Vibe, and these can be configured to give you five different sounds. The Monterey does not come with an expression pedal, as many players already have one they can use. We do offer the M-Audio expression pedal. It works well and is very reasonable. The Monterey is not battery powered. You will need a standard 9V 100mA supply, negative tip. The right stomp switch activates the fuzz channel. The fuzz channel has been designed to give you a rich, full, classic two-transistor fuzz sound that is accurate yet has a touch of smoothness added. It is very responsive and dynamic. It plays well in any position on a Strat or Les Paul style guitar. At the heart of the fuzz are vintage Fairchild Semiconductor transistors. These moderate gain transistors offer the perfect fuzz tone and do not have the temperamental temperature related problems that germanium devices exhibit, while still giving you incredible tone. The modulation channel is where the fun really starts. The Monterey Rotary Fuzz Vibe offers an Octave effect with both the Vibe and Wah sounds. With those two sounds you can either have Octave Up, Octave Down, or No Octave. In the Center Position of the Octave Control you have NO octave up or down. If you turn the Octave Control up (or clockwise), you have an increasing octave up sound. As you turn the Octave Control down, you have an increasing amount of octave down sound added. Again, if you do not want an octave effect added, simply set the Octave Control to the center position. The Monterey Rotary Fuzz Vibe features a very rich and deep vibe sound. The “Kool Vibe” setting is perfect for getting complex phaser-like sounds. It combines phasing and tremolo at key frequencies to give you incredible depth and rhythm. Not only does it match the frequency response of a vibe, it simulates the unique pulsing of a photo-cell based effect. You can add the Octave to the “Kool Vibe” for an amazing doubling effect or for an incredibly deep synth bass type sound. The “Les Rotary” sound in the Monterey Fuzz Vibe is both very accurate and surprisingly new sounding. Like the original cabinet, this simulation joins both the lower drum and the upper horn into a rich, dimensional effect that generates an unmistakable chorus and tremolo soundscape. Not only is the cabinet itself simulated with very short reverberated reflections that offer a doubling effect, the Doppler Effect provides a soothing chorused sound that is clean and ethereal. The Octave Control in the Rotary cabinet simulation controls the volume of the horn or tweeter sounds. It does not produce an octave effect here. This allows you to get a very chorus-like effect with ample high-end detail when simulating a “Les Rotary” style cabinet. Set the Rate OFF for no rotation, turn the Fuzz on, and the Depth and Octave controls give you a wonderful speaker cabinet simulation. It’s fuzz with tonal control like you’ve never had before! Perfect for matching any size of power amp with the pedal’s fuzz to give you anything from dark overdrive to hard, edgy, squared fuzz! 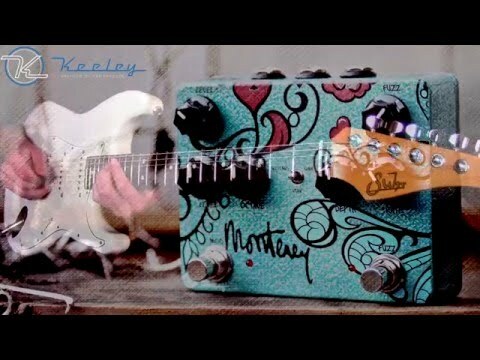 The “Harmonic Wah” section combines several more new sounds from Keeley in the Monterey Rotary Fuzz Vibe. It is a fixed or cocked wah sound, an auto wah, a harmonic/tremolo wah, and even a regular foot-controlled wah when you add an expression pedal. With the Depth Control turned all of the way down/off you are in the Wah Mode. The Wah Mode gives you control over the frequency you boost by adjusting the Rate Control. If you have an expression pedal connected, it becomes a regular Wah Pedal. Turn the Depth control up a slight amount and the Monterey becomes an Auto Wah. In the Auto Wah mode, your pick attack and strength creates an envelope filter sound. After the noon/center position on the Depth Control, you have the new Harmonic Wah. It is like the harmonic tremolo on a brown face amp, but the frequencies are centered around a wah pedal instead. It’s ideal for players who like the rhythmic back-and-forth rocking sound of a wah pedal. Do you own Keeley Monterey Rotary Fuzz Vibe or have you had a chance to try it?